Every week, we'll be recapping all of the totally outrageous — yet totally awesome — developments on our favorite political drama, Scandal. Check out last week's Ridiculist here. Did you miss the Scandal family over the holidays? We know our lives were a little emptier without the Gladiators. But, it seems they've sure been up to plenty of hijinks while we were stuffing our faces with turkey and mashed potatoes. Liv and her apparently terrorist-mom (spoiler alert! But, not really because of course there had to be a twist!) 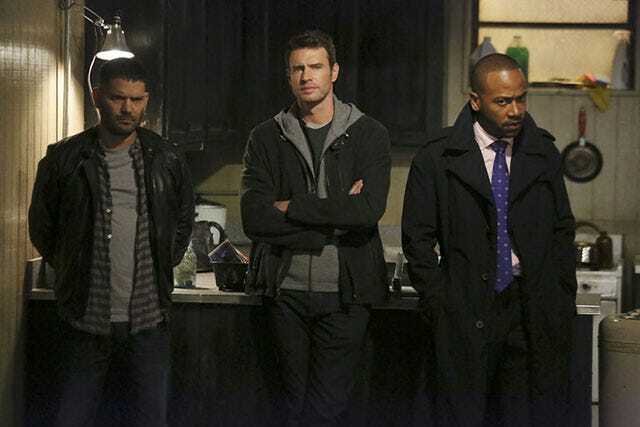 have gone and had themselves a sweet little dysfunctional reunion, and Huck and Quinn have gotten way more screwed up. Isn't it good to know that our families aren't the only ones with issues? Now, on to the Ridiculist. Dude, seriously Huck? We already have the obligatory teeth-falling-out nightmares, we really didn't need your serial killer-slash-torturer persona to contribute. Also, that's really not the correct usage of YOLO. Maybe we're naive, but do we really have the technology to implant tracking devices in humans? That's some dystopian ish right there. Okay, we can't be the only ones who felt the sexual tension between Jake and Fitz in the oval office. Two tall, handsome, brooding men metaphorically fighting for the same woman? Steamy. "If you think I enjoy killing then you don't know me very well. Condone at times, accept as necessary, but I get no enjoyment out of ending a life." That may have been the first time we even got a hint of not despising Rowan. We don't even know where to begin with this whole James-Cyrus thing. Get a dang divorce already! You hate each other! "I just wanted to hear your voice and talk about jam." That might be the most genuinely romantic and sentimental thing Liv's ever said. In fact, we think we're going to make it our new catch phrase. Oh snap, here come the waterworks. Thanks Liv and Liv's mom. Wow. Just, wow. We get the whole kill-'em-with-cliff-hangers thing that Scandal embraces so much, but sometimes we wonder if it's a wee bit overkill. So much happened in the last three minutes that we already forgot what we're supposed to be mystified by.